If you have played and studied the trombone, then it is likely you are familiar with the book commonly referred to as the “Rochut” book. 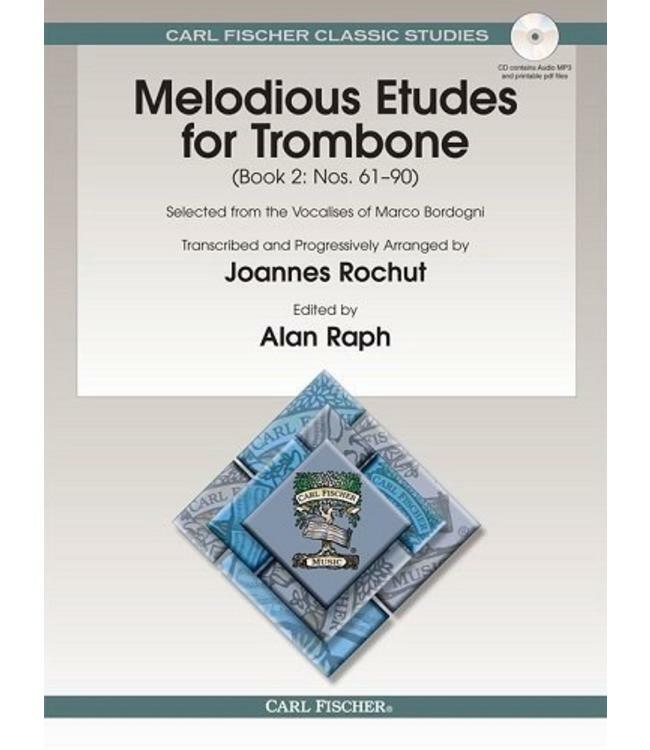 In 1928, Joannes Rochut edited Melodious Etudes for Trombone, published by Carl Fischer Music. Rochut thoroughly selected and edited the wonderfully lyrical vocalises, composed by master vocal pedagogue Marco Bordogni, and so the study of the trombone was forever changed. After more than 80 years, Carl Fischer Music editors decided it was time to give this long-established publication a fresh new look. We asked the renowned trombonist and author Alan Raph to re-edit the book to fix errors that have existed since its inception. It was Raph’s intent, however, to preserve the important pedagogical sequence established by Rochut, while also taking this new edition one step further. Piano accompaniments have always existed for these delightful etudes and Mr. Raph has now made them part of this new edition. On the included CD, you will find PDF files of all of these piano accompaniments as well as superb MP3 recordings by pianist Rae Moses. With the inclusion of the piano accompaniments, the practice experience is greatly enhanced and the player can deepen their musical expression. This, along with painstakingly edited and re-engraved music, takes this seminal book into the twenty-first century. Every serious teacher and student of the trombone should have this new edition as part of their repertoire. For advancing players.